Old coloured map of the South Pole. Printed in Nuremberg by Johann Ernst Adelbulner in 1718. Old coloured map of the North Pole. Printed in Amsterdam in the year 1638. Abraham Ortelius: Septentrionalium Regionum Descrip. 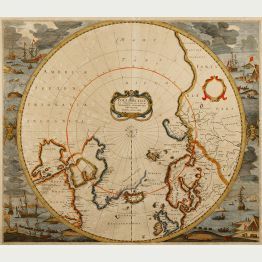 Old coloured map of the North Pole, North Atlantic. Printed in Antwerp in the year 1584. Old coloured map of Australia, South Polar Region. Printed in Paris in the year 1714. Antique map of the North Pole. Printed in London by E. Bowen in 1747.